In coordination with Irmo Arbor Day and the Michael J. Mungo Foundation, The Lower Saluda Greenway Initiative planned and landscaped an entrance to the Hollywood-by-the Lake community at the corner of River Road and North Lake Boulevard in honor of Pat and Johnny Jeffcoat for their contributions to our community. 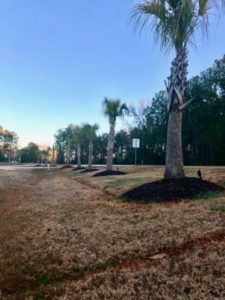 The project featured ten beautiful palm trees lining the road with upward lighting installed at each tree, and new signage was constructed near Highway 6 with evergreen shrubbery planted to complement the design. 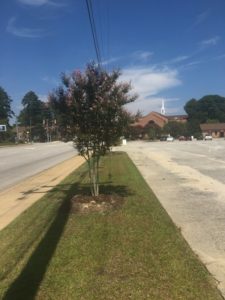 The Ben Lippen improvements made possible by the Irmo Arbor Day Committee consisted of planting 13 crepe myrtle trees along St. Andrews Road and adding new sod and irrigation along the way. The irregular parking lot asphalt was cut to redefine the border along the tree planting area in order to create a more aesthetic appearance. Diseased junipers in the islands to the right of the building were removed and replaced with willow oak trees to provide shade in the future. An arborvitae tree and cleyera shrubs were planted to the left of the building screening a playground area. 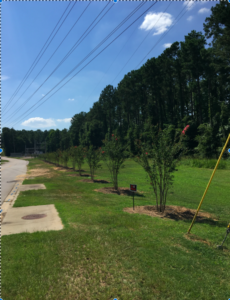 In late October, Keep the Midlands Beautiful partnered with TD Bank to plant 30 crepe myrtle trees across from the Saluda Shoals entrance at Bush River Road. TD Bank donated the trees to Keep the Midlands Beautiful from their TD Tree Days program that expands urban forests and green spaces in communities. KMB coordinated the details to make this happen.